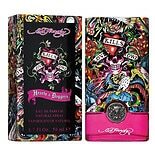 If you or a loved one is a fan of Ed Hardy designs, try any of the variety of Ed Hardy fragrances for men and women. Not only do the bottles and packaging feature the recognizable artwork of Ed Hardy, but they contain tantalizing scents that can last throughout the day. You can look at the different fragrance notes found in various Ed Hardy fragrances here at Walgreens.com to help you decide which one suits you best. Both women's and Ed Hardy men's colognes are available in eau de toilette and eau de parfum sprays. With a higher concentration of fragrance, a little bit of eau de parfum can go a long way. You can use eau de toilette sprays for a subtle scent or for layering your Ed Hardy perfume with another complementary scent. We carry signature fragrances such as Hearts & Daggers, Love & Luck and original scent for men and for women. If you're looking for an extra-special gift, browse the variety of Ed Hardy gift sets available. You can find favorite fragrances together in sets that include sprays, shower gel and even deodorant. Some include different spray bottle sizes so that you can carry the fragrance with you wherever you go. The various forms of these Ed Hardy fragrances are ideal for layering the same scent to help it last all day or evening.